When receiving damage, a player can use this card. The damage is reflected back to the source. This card cannot be used to counter itself, making it different than a Negate. This is because the is only one source of the damage. For instance, if Cao Cao attacks Da Qiao. Da Qiao uses "Displace" to pass it to her sister Xiao Qiao. She then uses "Fantasy" and passes the damage to Zhuge Liang. Zhgue Liang uses this card. The damage then is passed back to Cao Cao since he is the source. When the damage is passed, the effect of the damage are pased as well. Additional effects are passed with the damage. This card cannot be used when met with another Reflect. This passes the damage straight to the source. 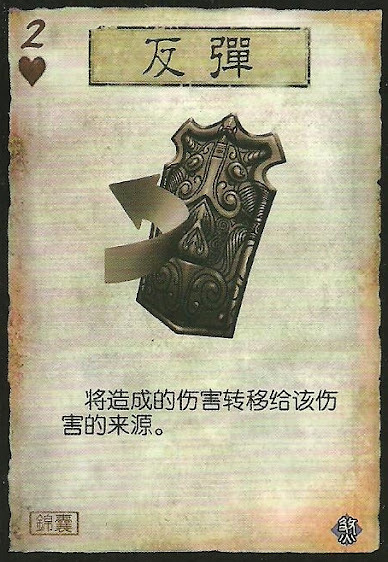 Other abilities such as Xiao Qiao's "Fantasy" do allow her to re-pass the damage back. When someone is losing health and not being damaged, they cannot use this card. This can only reflect damage.